The internet connection inside the DLSU campus has always been a source of stress for the Lasallian community. Aside from being slow, it is only confined to a few access points, limiting the number of devices it can cater to. In an interview with The LaSallian, Mr. Allan Borra, Director of the Information Technology Services (ITS) Office said that the problem with the University’s Wi-Fi can only be solved by a complete overhaul of the system, which, in this case, is the change of Wi-Fi provider. “The sentiments of the students [and] faculty of the University regarding the slow internet have never been overlooked. As a matter of fact, we have tried and are still trying our best to fix the problem. Part of this is troubleshooting existing issues and gradually introducing new elements into the system, like changing the current internet provider,” he explained. In determining the new internet service provider (ISP), Borra shared that they looked at three main factors: speed, bandwidth, and price. The first two factors came into play as Borra and consultants from the ITS Office searched for an ISP that provided a high bandwidth to accommodate the number of people who rely on the campus Wi-Fi service, which will also allow them to use the Internet at the fastest speed possible. However, the office also had to account for the cost of availing a service that meets these demands to avoid any implications of a tuition fee increase due to the change in ISP. Borra disclosed that several ISPs came forward with their respective proposals when the University began contacting them for inquiries. These included the top three commercial ISPs in the country: Globe, PLDT, and Skycable. Industry newcomer Converge ICT Solutions, Inc. emerged as the winner after proposing a fiber connection broadband option that is efficient, economically viable, and suited to the needs of the Lasallian community. Converge’s main advantage over existing industry players is the fact that it does not have a data cap. This means that users have access to unlimited volume allowance, allowing them to fully take advantage of what they paid for. Although the formal paperwork is still being finalized, the University is planning on availing of a modified version of Converge’s package for large enterprises. Aside from a connection that boasts internet speeds of up to 1 Gbps, it also includes other services such as disaster recovery and managed data center services. Students and faculty members alike expressed joy over the announcement from the ITS, which will soon end years of struggling with myWiFi’s sluggishness and limited user capacity. Aya Cruz (II, BS-MGT) shares that having access to faster Internet could give students a chance to make more productive use of their time, without needing to leave the confines of the campus. “Most of the time, you’ll find students spending thousands of pesos each term to work in coffee shops with fast Wi-Fi just to get their projects or thesis done. Now that DLSU is upgrading to a better provider, working on-campus actually seems like the better option,” she concludes. Professor Isagani Tan of the Communication Department finds that the improved Wi-Fi service gives professors like him a chance to innovate the classroom experience by integrating more learning options that they had previously avoided due to speed limitations. “Now, we struggle with simply loading Youtube videos or downloading presentations. Soon, we can even consider having video calls with the researchers who wrote the articles we discuss in class. This is simply one of many possibilities for enhancing our students’ education,” Tan said. Other professors – particularly those from the faculty of the College of Computer Studies – echo Tan’s sentiments. ITS and Converge are in the process of scheduling pilot tests in different areas of the campus to determine which places are optimum hotspots. The trial runs are expected to begin in mid-June and will last until the end of July. Students and faculty are encouraged to actively participate and give feedback on their experiences with the Converge Wi-Fi through a Google Form that will be sent to their DLSU email accounts. Once the feedback has been collated, ITS, Converge, and representatives of the University administration will also meet to finalize the terms and conditions of usage. These will be patterned after current regulations stipulated in the student handbook that restrict students from accessing inappropriate websites, such as those containing pornographic material. 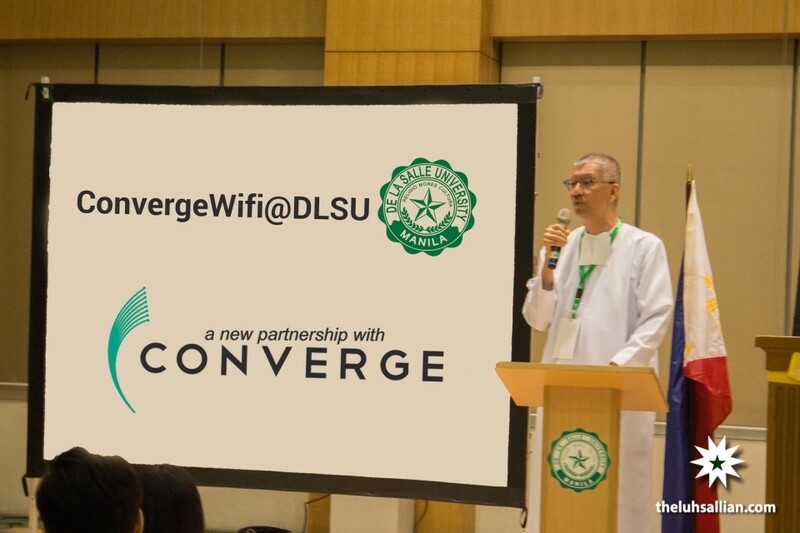 Should all things go according to plan, the new Converge-powered DLSU Wi-Fi is expected to be up and running by the beginning of AY 2018-2019.